Hélène Druvert is clearly a talented artist and designer as evident in her previous projects Paris Up, Up and Away (2016), Mary Poppins Up, Up and Away (2017) and again here with New York Melody. Fans of the earlier titles will find Druvert’s style consistent, making this more like a third release in a series. 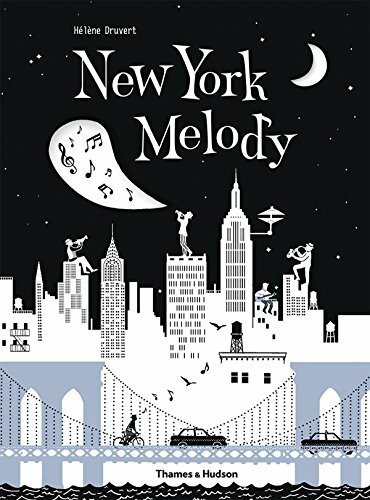 New York Melody describes the wanderings of one little tiny music note as it flies free from a classical concert out into the night over the streets of New York City. It flitters from instrument to instrument, venue to venue, genre to genre, participating in each scene as an active member of the song it hears. Carnegie Hall, Broadway, and jazz clubs are some of the locations where it pauses to swoop and loop, shoot and zoom. Little music note dances its way through intricately cut silhouette settings. Accompanied by black, white and gray backdrops, these laser-precise cutouts are simply stunning. Part of the appeal comes from admiring just how fine, fragile and delicate are these seven diecut pages. There is no denying the elegance of this book. It is an artistic trophy that will proudly grace any storybook collection. But there is a disconnect with what is assumed as the target audience and the practicality of such fine artwork. It is a bit like having a room full of expensive and breakable objects that no one, least of all children, can enter for fear of ruining something precious. On the one hand, the younger (target) audience of five to eight year olds might find the thick, board book cover good, solid and sturdy. They may find the juvenile rhyming scheme of the story tolerable. And they will be wowed by the fantastic centerfold artwork which, while not at all a cutout page, is the eye-popping, gold embossed, stylized trumpet that hijacks the book in a beautiful improvisation. On the other hand, only adults will appreciate the technical skill that went into the diecut design, the process of cutting it, the positioning of the voids over their respective backings, the tissue paper protector sheets that come inserted between each cut page and the attention to detail involved in the artwork. If the readers want any longevity from this book, it will need to be handled with kid gloves and not by the kids themselves. Another point of disconnect is the narrative. The rhyming is not a terrific choice for this project. It is a clunky partner with two left feet paired up with the suave and dapper Fred Astaire leader. No matter how lovely the one is, the other gets tangled in the way. Onomatopoeia choices also seem to be targeted at an even younger age with “TOOT” and “RAT-TA-TAT-TUM” effective more for toddlers. Pluses and minuses aside, the little music note of New York Melody may just claim an adorning spot on the shelf between Druvert’s Eiffel Tower of Paris and her Mary Poppins of London.